The emergence of powerful new cultures is often accompanied by the rise of powerful new religious narratives, with which leaders seek unify their domain under a spiritual foundation sympathetic and congruent to their regime. In times of crisis, this narrative may further evolve and gain accretions. Establishing a mythological basis for a culture is an ancient technique designed to place that culture’s origins back in a place called ‘mythic time’ – in an unassailable period of timeless ‘fact’ lying somewhere beyond the horizon of verifiable history. This mythology provides a justificatory provenance which supports the new order, but the phenomena is one which – after great periods of time – continually confounds enquirers seeking to untangle the truth behind the history of cultures and their mythological aspects. In the case of the ancient city state of Rome, its different phases of cultural development (economic, military and religious) demanded establishment of and refinement of a popular founding myth. In so doing, its leaders were calling upon the traditions borrowed from the oldest and most glorious city states, of which Babylon (established circa 2800BCE) is a particular example. Largely following in the footsteps of Greek and Phoenician examples, Rome required a founder who existed in a time when men and gods walked the earth together – the mythical ‘bridging age’ of demigods, around which most legends evolved. Mere historical truths could be easily revised by fact, but in the popular imagination the divine was more unassailable. 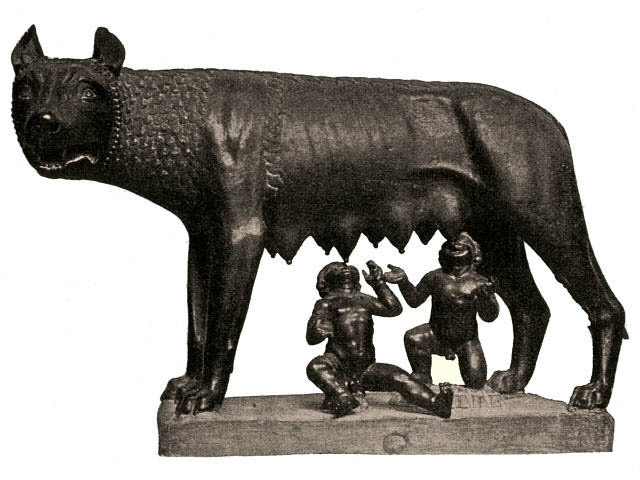 Romulus and Remus and their Lupine ‘mother’. With cultural change and revolution, comes a re-mythologizing of the past in the image of the present. As most of the histories of Rome’s past come to us from the late Republican era at the earliest, we are at a loss to determine fact from mythology and invention. The Roman Republic was said by later histories to have commenced with the overthrow of the last king of Rome, Lucius Tarquinius Superbus, in 509BCE. It is hard to say for sure if this founding event (albeit later trumpeted as such) actually occurred or if that king was indeed real. It may have been an historical invention by a culture struggling to trace its faltering early steps from ‘barbarity’ into the era’s idealised Hellenic models of power and polity. Tribalism, chieftains and tyrants were a typical Greco-Roman shibboleth for the majority of Europeans whom they considered Barabarians – Celts, Thracians and those living north of the Danube and the Rhine who had not assumed the trappings of Hellenic and Middle Eastern cultures. We might add the class of ‘Romans’ to those whom Greeks considered also considered ‘barbarian’. The distinction between social classes during the era of the Roman Republic was a typical dialectic split between the aristocratic dynasties of landed gentry (the ‘Patrician’ class) who typically traced their family pedigrees back into the city’s supposed and actual Regal Era, and the more ordinary ‘Plebians’ – families (gens) without historic aristocratic pedigree, but keen on building their own modern dynasties. It can be considered a typical Old Money/New Money dialectic – absolute power was held by neither, yet strived for by both. As such both groups had different needs in using mythology to bolster or establish their claims to rights and power. Since the Roman Republic (which cam to an end in 27BCE) is the first era from which we have definite supporting history and archaeology, Rome’s Regal Age (Romulus, Numa, the Tarquinians etc) must therefore constitute its first mythological ‘event horizon’. It was from this age that was generated the archetypal image of a ‘good king’, Numa Pompilius (said to have ruled 715 – 673 BC), who was so lauded by Rome’s first Patrician Emperors. Numa was said to have instituted peace, wealth, economic growth and the structure of Roman religion and its calendar of observances. By the Augustan era (after 27BCE) Numa therefore served as an idealised ‘historic’ founding father for Rome’s new aristocratic Imperium. The city’s ultimate supposed founder, the fratricidal Romulus, was more of a ‘mythic’ founder. This was the narrative later employed by Livy and his literary compatriots of that New Order. Rome’s earliest autocthonus history that we know of is that of Quintus Fabius Pictor a soldier-statesman of the ancient patrician Gens Fabii who participated both militarily and diplomatically in the Roman Republic’s greatest crisis before the 1stC BCE: the Second Punic War (218 to 201 BC). This war was an attempted conquest of Rome by a combined force of Celts, Numidians and even some Italians, led by the Carthaginian Gens Barca dynasts Hasdrubal and his brother Hannibal. Fabius’ lost history of Rome was later cited by Livy (Ab Urbe Condita Librii) as the source for its founding myth of Romulus and Remus, as heirs of Aeneas of Troy, and the line of pre-Republic kings who ruled after them. It was written in Greek and would have served as a brilliant piece of contemporary propaganda designed to garner support for Rome from among the Greek world (itself no lover of the Celts) in the wake of the Punic crisis, through citing a common Greco-Roman origin. This supposed ethno-cultural connection with the Greeks was very popular in the more deeply Hellenised patrician classes, many of whom spoke Greek and studied Greek culture as a high cultural ideal. The stories of Aeneas, the kings of Alba Longa, Romulus and Numa, were however, not necessarily a Roman idea: the Grecophile Fabius had borrowed the story of Rome’s earliest kings from an earlier Greek historian: Diocles of Peparethus, whose lost works included histories of the Persian Empire, the significance of which becomes more important as we delve further into the myth of Romulus. It stands as a good example of how mythology, posing as history, can respond to a state of crisis. A more overt consequence of the second Punic War upon Roman state religion was its importation of the worship of Magna Mater/Cybele from Phrygia in Magna Graecia, which was not just the donation of a goddess and her cult, but actually involved the translocation of its principle idol and priesthood from Mount Ida in the Troad (the district in which ancient Troy was supposedly located). The Greeks equated Cybele with Rhea (associated with the similarly-named Mount Ida in Crete), and the name of the legendary mother of Romulus and Remus from the Roman histories – Rhea Silvia – seems simply to be a Romanised metathesis of ‘Rhea Cyvele‘. This suggests the possibility that the history of Fabius and the introduction of Magna Mater were possibly part of a concerted conscious effort of state cultural and religious propaganda. As it happened, Cato’s political rival Scipio, was victorious over Hannibal and occupied Carthage after a series of decisive and stunning military engagements in Hispania and in North Africa, making these into Roman provinces. Soon after, Rome was to conquer the Achaean league and take Greece itself – its religious and social makeup would be forever changed, much to Cato’s dismay. The late Roman Republican era culminated in the city’s stunning territorial expansion, driven by the twin threats of incursion of the Celts from the north and the sequelae of the opportunity caused by the fractious instability of the eastern military Empire founded by Alexander the Great. This opportunity culminated in both stunning conquests (Caesar’s taking of Gaul and Pompey’s campaigns in Africa and the Middle East) and Rome’s next great period of crisis in which militarised internal factionalism and power struggles threatened the root and stability Rome’s establishment. It was a period of chaos, civil war and a controversial de facto regicide in the case of Julius Caesar. The man who eventually established peace and a new era of stability was Octavian, who became Rome’s first Emperor – Caesar Augustus – in 27BCE, founding a dynastic line of subsequent emperors. The ‘Augustan Period’ (27BCE-14CE) marked another important milestone in Rome’s deliberate efforts at significant cultural re-invention and re-mythologizing. There was an explosion in the expression of ideas about Rome’s past in literature, almost certainly engineered by Augustus himself. Of these, the works of Livy with his new history of Rome: Ab Urbe Condita Librii, and the epic poetic equivalent represented by Vergil’s Aeneid served to concrete the past in the image of Octavian’s new order. Both borrowed from newly translated Latin versions of Fabius’ History. Ovid’s ‘Metamorphoses‘ provided the Greek world with ample evidence of Rome’s superior abilities in the poetic and mythological arts. Vergil, Ovid and Livy’s works spanned a dialectic between popular culture (the mythology and poetics of the Aeneid) and serious historical scholarship (Livy) and were runaway hits that succeeded in promoting the new Empire’s ideals. As usual a certain amount of licence was taken with facts in order to portray a seemingly cogent, continuous and ordered rise from Rome’s noble but humble origins in the 8thC BCE to the greatness of Augustan Rome, which in the era cited for its founding myth was probably no more than a small and insignificant village on the Tiber. The reality of Rome’s growth was probably very different and more chaotic than historians of the Empire would have us believe. The earliest part of the book is probably entirely mythological, and is thought to be based on Fabius (3rdC BCE) who based his work on Diocles (4th/3rdC BCE). Both of these works are lost. Livy’s account places the founding of Rome as part of the dynastic succession struggles of the Kings of Alba Longa – said to be heirs and successors of Aeneas of Troy, who settled with his people in Italy, after that Homeric idealised prototype city-state‘s fall. Livy’s famous account seems very close to the myth of Sargon, used in the founding myths of the city-state of Babylon and its later clutch of Persian-Judaean whelps and their story of Moses. The twins seem very similar to the mythical Greek twins, Kastor and Polydeukes (Interpretatio Romanum: Castor and Pollux), one of whom was mortal, the other divine. The story is also echoed in the Hebrew story of Cain and Abel. Divine triads and the two faces of Roman Mars. Rome’s ancient god Mars represents a curious religious dialectic: On the one hand, he is perhaps best known as a god of war, and on the other he has an older more mysterious incarnation as a god of agriculture and earth’s riches. He remained one the most popular gods of the state religion up until its conversion to christianity. This and the custom of opening the temple doors equates Janus resolutely to the Archaic triad of Jupiter-Mars-Quirinus under a military aspect. Why, then did Rome adopt the Capitoline triad in its place? It certainly was not averse to war – indeed, the doors of the temple of Janus were probably more often open than closed! The key to understanding the answer to this question is to be found by looking at the females behind the Capitoline triad. Minerva was the feminine counterpart to Mars in his role as war-god, and was depicted with the same attributes: the spear and shield. However, she was also the goddess of intellect and wisdom – those crucial characteristics which avert war or guide it to its successful conclusion. It is perhaps the fundamental incompatibility between Roman Mars (who was also a chthonic agriculture-fertility deity) and the Greek conception of the war-god – Ares – who represented simply the idea of aggression and violence, devoid of the regenerative qualities implicit in Mars. Minerva herself was a ‘virgin’ goddess – an idea which did not necessarily imply chastity (in the sense so lauded by early Christians), but rather maximum fertile potential. Juno (Uni to the Etruscans, and Hera to the Greeks) represented the maternal protective force – jealous and fiercely protective, much like the wolf who adopted Romulus and Remus as her ‘pups’ in the old Roman foundation myth. She was the ‘Capitoline’ replacement for Quirinus, who is sometimes portrayed as a deification of Romulus, Mars – like Minerva – being the younger more active version of the god. Jupiter is Juno’s husband in conventional mythology, and Jupiter was the principle god to which warfare was dedicated. Greek and Roman legends are full of the conflict with Hera/Juno caused by Zeus/Jupiter’s constant seeking for mistresses by which conceive the other gods and demi-gods who people Mediterranean myth. In these, her jealousy seeks to protect the older order – their own union. She is thus a more mature aspect of Minerva, her daughter. In Greek and Etruscan myth, she is the nurse-maid of the ‘culture-hero’ Hercules/Herakles (who bears her Greek name), allowing him access to Olympus as a divine – much like the later myth of the she-wolf who suckled Romulus and Remus, allowing them to found Rome. Again, we can see how syncresis with Greek myths informed a change in the focus of Roman religion. Greeks tended to see their Roman cousins as closer to barbarians, and Romans were typically conscious of this in attempting to follow Greek religion.